HOUSTON — Olympic gold medalist Simone Biles and former First Lady Barbara Bush are among the 2018 Texas Women’s Hall of Fame honorees. Governor Greg Abbott and the Governor’s Commission for Women have announced the seven women who will be recognized for outstanding achievement and changing the course of history. “Each of the honorees is recognized as a trailblazer, an inspiration for the next generation of leaders who will follow in their footsteps in fields such as business, education, military service, philanthropy, public service, sports, the arts and sciences, and more,” Governor Abbott said. “Never give up. Always pursue your dreams.” Those are the words of the most-decorated gymnast in American history, the first female African-American all-around world champion and a five-time Olympic medalist—and still counting. 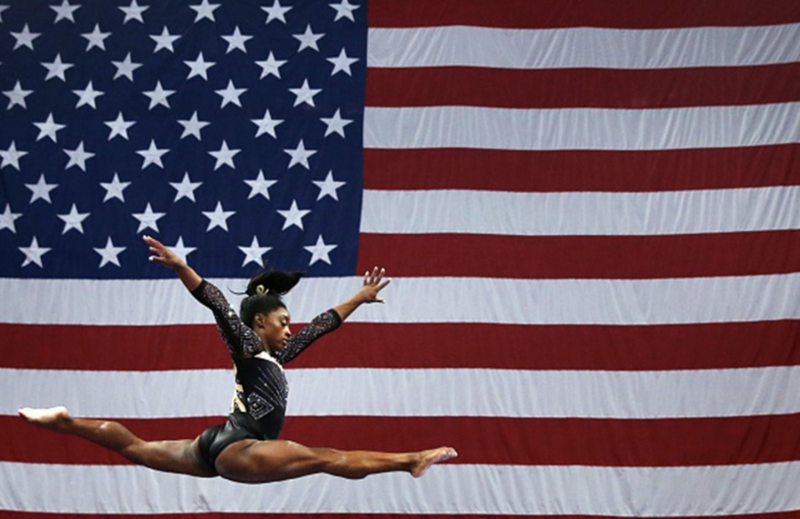 Simone Biles has shown strength, commitment and perseverance throughout her young life. Shuffled between foster homes as a young child with only a small backpack to hold her belongings, Simone and her younger sister moved to Texas, where they were taken in and adopted by their grandparents. Simone’s first glimpse of the world of gymnastics started on a field trip in her hometown of Spring, where she was homeschooled. Following years of training and sacrifice, her talent and passion have made her one of the top gymnasts in the world. But there is more to Simone Biles’ accomplishments than all of the medals and Olympic successes. When challenged, she has relied on her faith and family to stay focused and positive. 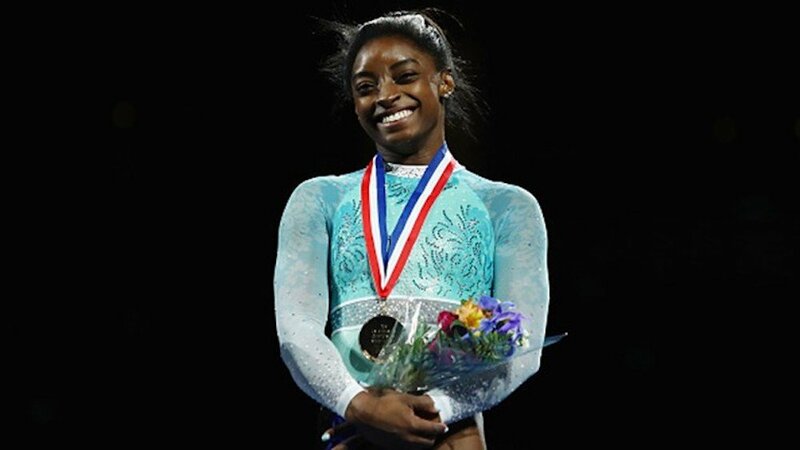 A champion in competitive athletics and in life, Simone Biles uses her voice to help others, who like her are fighters. Whether raising donations of clothes and school supplies for foster children or serving as an advocate, Simone Biles inspires others, shining a light not on her success, but on their needs. One of the most admired First Ladies of the United States and of Texas, Mrs. Laura Bush is celebrated for her lifetime of distinguished public service. Actively involved in issues of national and global concern with an emphasis on education, health care, human rights and the preservation of our nation’s heritage, she has traveled to more than 76 countries, including two historic solo trips to Afghanistan, and has launched groundbreaking education and healthcare programs in the U.S. and abroad. 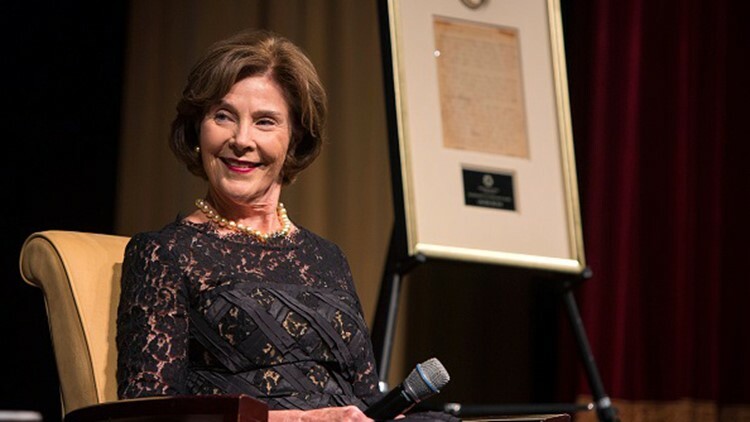 Author of the bestselling memoir, Spoken from the Heart, and co-author of children’s book Our Great Big Backyard, Laura Bush also founded the Texas Book Festival and the National Book Festival. Today as chair of the Woman’s Initiative at the George W. Bush Institute, Mrs. Bush continues her work on global healthcare innovations, empowering women in emerging democracies, education reform, and supporting the men and women who have served in the U.S. military. And as founder of Texan by Nature, Mrs. Bush is committed to native prairie restoration efforts and to teaching Texans the importance of conserving the state’s natural resources. A former teacher and librarian born in Midland, she holds a bachelor’s degree in education from Southern Methodist University and a master’s in library science from The University of Texas at Austin. When Hurricane Harvey struck a devastating blow in August 2017, Susan Dell challenged her foundation team to think in big ways about how they could help their fellow Texans. Susan and her husband, Michael, quickly committed over $43 million as part of a goal to successfully raise $100 million for rebuilding and recovery across 41 counties. Through the ongoing efforts of her team at the Rebuild Texas Fund, a wide network of organizations are now working on the ground to help impacted families and communities return to normalcy and economic stability. For Susan, the work is both vitally important and deeply personal—rebuilding the state where she and her husband grew up. This Texas-sized response to one of the state’s largest disasters is a natural extension of Susan Dell’s nearly two decades of philanthropic work. As co-founder and chairman of the Michael & Susan Dell Foundation, established in 1999, Susan is dedicated to improving the lives of children and families living in urban poverty and helping communities build stronger futures. Under her leadership, the foundation has committed $1.5 billion, working closely with nonprofits and social enterprises in the United States, India, and South Africa, to discover and accelerate practical, proven solutions that help people chart their own paths out of poverty. A successful fashion entrepreneur and mother of four, Susan is also an elite athlete, a past member of the President’s Council for Physical Fitness and Sports, a trustee of the Children’s Medical Center Foundation of Central Texas, and a board member of the Cooper Institute in Dallas. 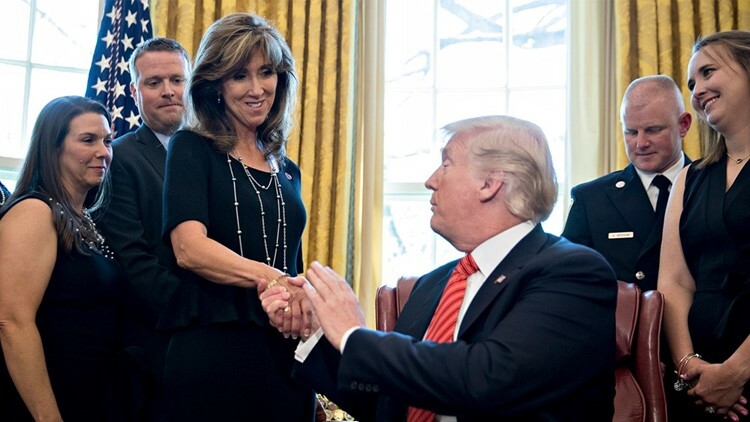 While she was not originally scheduled to be on the flight that day, Captain Tammie Jo Shults’ calm resolve and courageous leadership in the midst of crisis saved 148 lives aboard Flight 1380. During the climb out from New York’s LaGuardia airport, she experienced a catastrophic engine failure and a rapid depressurization when debris from the explosion punctured the cabin. Tammie Jo Shults’ professionalism and skill as a pilot, as well as her grace under pressure, allowed her to successfully complete a single-engine emergency landing in Philadelphia. Afterward, she personally spoke to and comforted each of the passengers. Although she was assured as a high school senior by a retired colonel lecturing on aviation at a vocational day program that women could not be professional pilots, she was not dissuaded and went on to prove him wrong. She has captivated audiences worldwide for more than six decades, using her melodic voice and magnetic presence to bridge many cultures. Born Florencia Bisenta de Casillas Martinez Cardona in El Paso, Vikki Carr signed her first recording contract in 1961 and released her Grammy-nominated hit single, “It Must Be Him.” A singer with remarkable technical skill, she gained effusive praise from stars such as Frank Sinatra, Bing Crosby, Ella Fitzgerald and Elvis Presley, and performed for presidents and royalty. Against resistance from her then male-dominated record label, Vikki Carr released her first Spanish album in the early 70s, paving the way for other artists to explore their Hispanic roots. Releasing over 60 best-selling albums, her popularity extended from the U.S. to Latin America as she championed the cause of unity through music and garnered three Grammy awards for her Spanish albums. In addition to a 2008 Grammy Lifetime Achievement Award, a Texas Medal of the Arts and other prestigious awards, Vikki Carr’s deep commitment to education and leadership development for Latino youth has gained her praise. Her philanthropy and advocacy efforts continue as she advocates for the family caregiver, bringing awareness to the much-needed resources and respite caregivers need. Still sharing her gift of music today, hers is a legacy of service, strength and perseverance. Though hers is the last name called in the Texas Senate’s alphabetical voting order, her work ethic and voting record are inarguably first in the record books. Senator Judith Zaffirini (D-Laredo) is the first Hispanic woman elected to the Texas Senate, the second highest-ranking senator, and the highest-ranking woman and Hispanic senator. Her legendary work ethic is reflected in her 100 percent voting record, a national record, having cast more than 60,000 consecutive votes and passed 1,024 bills, more than any other legislator in Texas history. Her priority legislation has saved and changed lives, including by reforming guardianship, Medicaid, nursing homes and welfare; prohibiting texting-while-driving; and improving access to justice, court security, organ donation, and services for Texans with disabilities and mental illnesses. She has received more than 1,000 awards and honors for her professional and public service accomplishments, including having an elementary school, university building, college library, road and rehabilitation center named in her honor. Her son endowed scholarships and grants in her name at The University of Texas and at its law school, Baylor College of Medicine, and Texas A&M International University. The owner of Zaffirini Communications and president of Alexander Investments and Alexander Development, she also is president of two foundations. A wife, mother and grandmother, she holds B.S., M.A., and Ph.D. degrees from The University of Texas at Austin, which honored her as a Distinguished Alumna. For nearly two decades, this humble risk-taker—a Catholic nun with a Ph.D. in microbiology from the University of Notre Dame—opened the doors to higher education for more first-generation college students, working adults and other underserved communities in Texas. One of the first women to lead a Texas university, Sister Elizabeth Anne Sueltenfuss of the Congregation of Divine Providence was in 1978 named president of Our Lady of the Lake University in San Antonio. During her tenure, the university experienced unprecedented enrollment growth. Weekend College, the first program in South Texas to offer classes to accommodate working adults, was launched, first in San Antonio and later expanded to Houston and the Rio Grande Valley. Campus facilities were upgraded through multiple ambitious capital campaigns. The nation’s first doctor of psychology in counseling psychology was accredited by the American Psychology Association. The first e-commerce degree program in Texas was launched. And the Hispanic Association of Colleges and Universities, now comprised of 380 higher education institutions that are home to more than two-thirds of all Hispanic college students in the U.S., was formed. Though she passed away in 2009, Sister Elizabeth Anne’s legacy of defying expectations lives on in every student who graduates and makes a difference; each walks in the path her devotion to meaningful learning helped blaze.